"This pot pie couldn't be easier. 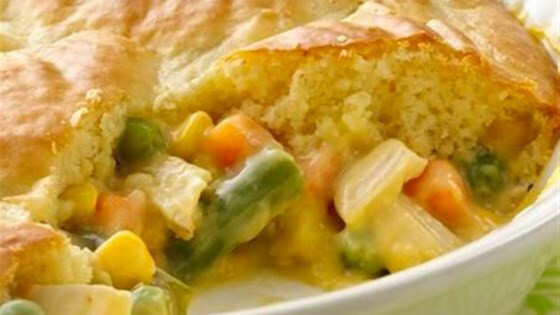 It's loaded with chicken and vegetables in a creamy sauce and baked under an impossibly easy crust." Heat oven to 400 degrees F. Mix vegetables, chicken and soup in ungreased glass pie plate, 9x1-1/4 inches. High Altitude (3500-6500 ft): Heat oven to 425 degrees F.
I made this with fat free soup, heartsmart bisquick, fat free milk, and egg substitute. It came out delicious. I have made this recipe for many years. It is really delicious just as the recipe is written... However, I do add Bell's Seasoning (to taste)...just a personal preference.